You will remember the name Kai Strand because I reviewed her book, THE WEAVER, some time ago. Kai has written another middle grade book, but this one is not of a fantasy nature. It’s about youngsters who could be students in any school in this country. And actually, it’s all too true as to what can happen when a person becomes a nationally recongnized figure. 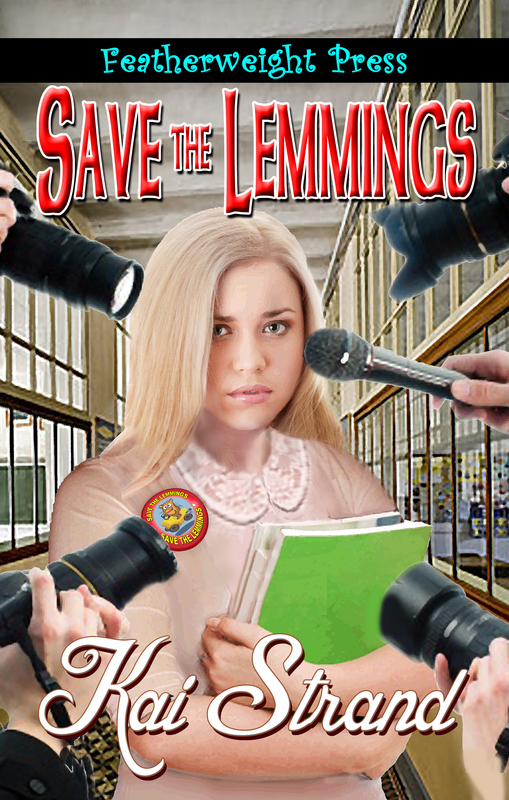 The name of the book is SAVE THE LEMMINGS. Kai, will you give us an overview of SAVE THE LEMMINGS? I think we’re all interested in how this typical American Girl’s life intersects with the legend we’re all familiar with. This brings up the question of legends and old wives tales that we would also like to hear more about. Thanks, Barbara. I would love to tell you about my young inventor, Natalie, and how the lemmings help her get a grasp on the important things in life. Eighth grade inventor, Natalie Isabelle Cailean Edwards is the N.I.C.E. girl who finishes last with the kids in school. Sappy inspirational phrases and monochromatic outfits have all but her best friends wrinkling their nose at her. When Natalie’s invention, the Texty-Talky, goes nationwide, she becomes an overnight sensation. Suddenly her days consist of photo shoots and interviews with little time left for her friends. A local reporter shatters her good-girl image by reporting a graffiti incident and the media launches into a smear campaign. It is so bad, even her friends start to believe the stories. Will Natalie be able to overcome the lies being printed about her? I think we’re now ready to hear what you have to tell us about LEMMING TRIVIA AND OTHER OLD WIVES TALES. First, about lemmings blindly committing mass suicide. Lemmings are solitary creatures except during migration. They bunch up along cliffs and dive into the water to swim long distances. Unfortunately some lemmings die of exhaustion or hunger. But they are not committing mass suicide. Don’t cross your eyes, they’ll stay that way. How many of you tempted fate as a child and kept your eyes crossed until the optic nerves grew tender? Sure enough, you’re not staring at your nose today. Knuckle cracking does not cause arthritis I’m happy (and relieved) to report. My hips crack loudly when I reach toward my toes. When I was a kid I got such a kick out of scaring people with the loud crack and then making a face as if it hurt. Their horrified expressions were so entertaining. Blessedly I’m not hobbling around on arthritic hips today. Were you ever told that swallowing your gum was bad for you because it takes seven years to digest? If that were the case that would make for a great weight loss program! Just swallow enough gum to suppress your appetite. It’s a shame that shaving your hair doesn’t really make it grow back thicker, darker and coarser. It would put Rogaine out of business! Drinking a warm glass of milk really can help you sleep. Milk contains tryptophan and will indeed aid your trip to slumber land. If you hold an aspirin between your legs, you won’t get pregnant. It’s true. Think about it. Chicken soup is good for a cold. The veggies and chicken can mitigate the inflammation associated with a common cold. It won’t cure you, but it may offer some relief. Thanks, Kai. Now lets hear a little about yourself. I write fiction for middle grade and young adult readers. My debut novel, The Weaver, was a finalist in the 2012 EPIC eBook Awards. The Wishing Well: Another Weaver Tale is set in the same storytelling village as The Weaver. I am a (very lucky) wife and the mother of four amazing kids. The most common sound in our household is laughter. The second most common is, “Do your dishes!” My family and I hike, geocache, and canoe in beautiful Central Oregon, where we call home. Kai, it sounds as if you lead an exciting life. Thanks for inviting me to be on Stories a la Mode, Barbara. It’s been a pleasure. To find out more about Kai’s books, download companion documents, find links to her published short stories and discover all the places to find Kai both virtually and in person, visit her website: www.kaistrand.com. She loves to hear from readers, so feel free to send her an email or visit her facebook page, Kai Strand, Author.